Epiphytic plant, fleshy roots, flexuous, glabrous. Stem short, completely enclosed by imbricating leaf-sheaths. Leaves shining, fleshy, leathery, at conduplicate base, obovate or oblong-elliptic or elliptic, acute or obtuse, of more than 22 cm. long for 10 cm. wide. Flower stalk almost erect, sometimes arcuate, generally simple, being able to be a little longer than the leaves, but often shorter, with rachis in zigzag. Bracts triangular, cucullate, acute, from 4 to 5 mm. Flower fleshy of 3 cm with well spread out segments. Dorsal sepal elliptic, obtuse, mucronate at apex. lateral sepals identical to dorsal sepal, obliques, distinctly carinate dorsally. 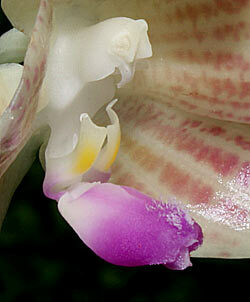 Petals largely elliptic or sub-orbicular, slightly acute or obtuse. Lip adnate to column-foot, distinctly Clawed, 3-lobed, a little longer than the petals. Lateral lobes directed towards outside, oblong-linear, longitudinally sulcate in middle, the former part more fleshy than the posterior one with a bidentate acute apex. Midlobe narrowly obovate-oblong or oblong-elliptic, very fleshy, almost trigonous, indistinctly carinate in middle, slightly incrassate at apex, decorated with few hairs. Disc between the lateral lobes provided of an appendix turned towards back, hardly bidentate. At the junction of the lateral lobes and midlobe there is a fleshy callus, bidentate, longitudinally sulcate. Column fleshy, almost cylindrical, sometimes arcuate, 6 mm long. Pedicellate ovary up to 2 cm long. Flowering is possible all the year, but with two peaks, one in April, the other in September. It's of short duration (4 weeks). The color of the floral segments varies from white to greenish yellow and yellow, marked of longitudinal strippes consisting in fact in a succession of small brown/purplish points giving to the unit a tesselate appearance. Yellowish lateral lobes with a paler suffusion at base. White disc. Midlobe lilac or purple , white base. White column. Slightly perfume of violet. It grow since the sea level up to 700 meters of altitude. This plant is in process of extinction in nature. The last known site, in the south of Cianjur or one found it even in the coffee plantations was razziate by an Indonesian specialist. 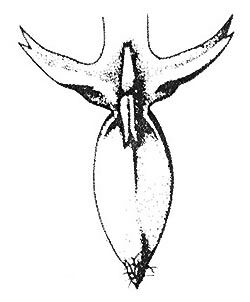 The first European flowerings was in 1914. In April of this year there were two simultaneous flowerings. The 16 first of all in Ireland, then the 28 in Mur de Bretagne at Mr Liouville *. the species disappeared then from the cultures to be rediscovery about 1975. Rare in culture. *The very interesting collection of Mr. Liouville of Mur de Bretagne was given thereafter to the Natural history museum of Paris. J.J. Smith originally described P. Javanica in the Bull. Jard. Bot. Bull. Ser. 2, 26:77 (1918). Published information about P. Javanica is very limited. Sweet (1980) and Comber (1990) published two small reports on the species. According to Sweet (1980), the species was first recognized in 1914 from a collection in the Royal Botanic Garden, Glasnevin, Ireland by Sir F.W. Moore. Leaves are more or less oblong, undulate and a bit thinner than the others of the same genus, each plant produces 2-8 leaves, 20-28 cm x 8-13 cm; bright green with a shiny surface. Flowers are arranged on a inflorescence, on pedicels which gradually lengthen as the flowers appear in succession. At the time the flower bud emerges it appears sessile, but the pedicel develops and continues extending while the bud develops, reaching up to 2.5 cm in length. Sepals and petals 1-1.3 cm x 1.5-2.0 cm, white but sometimes varying from white to greenish-yellow, marked with longitudinal stripes consisting of numerous small brownish purple spots giving the whole an attractive appearance. The white lip has a purple apex, hairy at the tip of the apex. 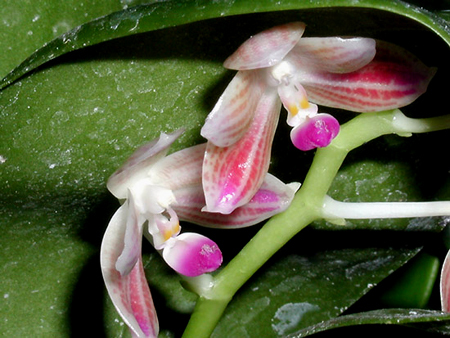 Flowering is not simultaneous, with only 1-3 flowers on each peduncle blooming at a time. 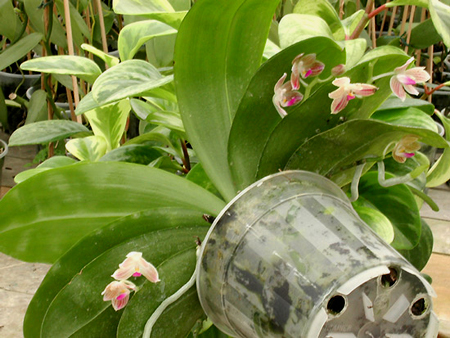 If the plant is healthy, a single stalk can produce more than 10 flowers. Flowers mostly face downwards and do not fully open. Flowers are about 3-5 cm across the lateral sepals. P. Javanica does not have a flowering season, so can produce flowers throughout the year. Each flower can bloom for about 2 weeks, however, if pollinated they last 7 days before wilting and the spur inside the pedicel begins to swell. Fruits are ca. 7.5-8.5 cm long, 3.0-3.5 cm diameter, and contain numerous seeds. P. Javanica is endemic to West Java. Comber (1990) reported that this species was originally collected in South Garut, West Java. 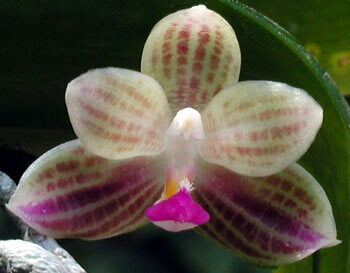 It is found at altitudes from 700-1000 m in south-eastern parts of West Java. In 1975, a team from Bogor Botanic Garden collected P. Javanica on a mountain in South Cianjur where it occurred in some abundance in the forest. Unfortunately, all the collections made at that time have since died. In 1992, staff from Bogor Botanic Garden returned to South Cianjur in search of P. Javanica and found local people selling wild-collected plants. At present, Bogor Botanic Garden has 10 specimens in cultivation. P. Javanica is rare, and is threatened in the wild by the excessive exploitation by local people for sale to collectors. Another major threat is loss of habitat due to conversion of forested land and forestry. The staff of the Bogor Botanic Garden are undertaking a conservation programme to assist the survival of the species. Unfortunately, germination of seeds has to-date been unsuccessful. Attempts to propagate the species by both seeds and vegetative parts are still being undertaken.